If you have never tried Falafel before, what the hell have you been doing with your life!?! These are deep-fried balls of chickpeas, coriander, chili and garlic and they are incredible served with cool Garlic and fiery chili sauces. 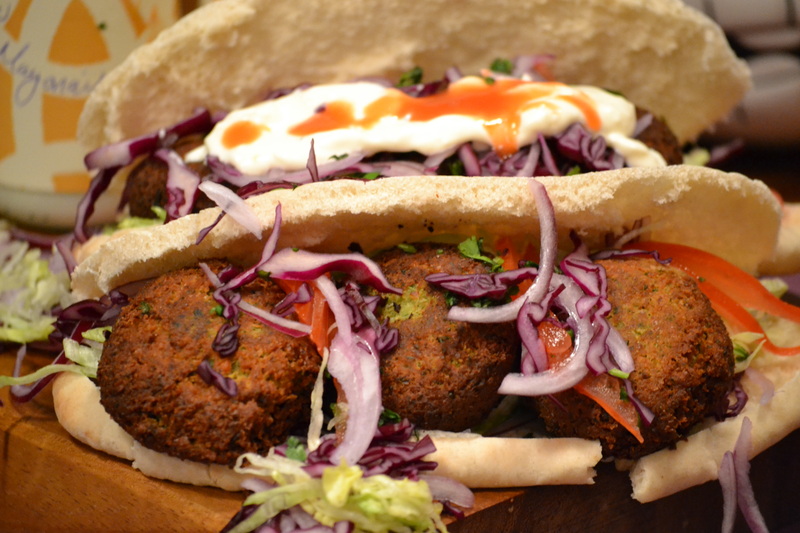 Falafel are traditionally served on their own with a simple salad and some dips, but I’ve decided to stuff them into pittas!! Kick things off by making the falafel mix – simply sling the coriander, chickpeas, garlic, onion, cumin, chili and egg into a blitzer and wazz to a paste. The mix should be pretty dry so make sure you have drained the chickpeas really well, mush them with a fork if you have to to get all excess liquid out. Next form the mix into the size and shape of gold balls and set to one side. Get a wok or a deep fat fryer on and crank up to 170c – then drop in the falafels in batches of 3. They will only take around 2-3 minutes to cook to the perfect ‘crisp exterior and fluffy interior’ – keep and ey eon these don’t let them cook over but you do want a deep crisp and golden brown colour. Drain the falafels then stuff them into pre-loaded pittas filled with crisp lettuce, sliced onion and shredded red cabbage. Drizzle over a good garlic sauce and some fiery chili sauce. Job done – make sure you have a really cold beer for these beauties. 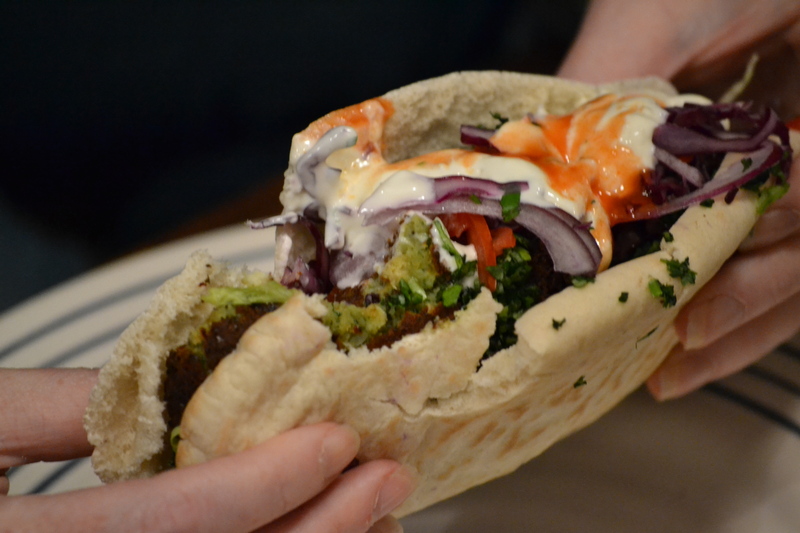 Looks great, nice use of pitas as a shell for the falafel! Thanks! They are – I could eat Falafel all day!! I think it tasted really nice. Thanks so much for sharing!!! Do, do!!! You’ll love them. Falafels will knock your socks off!